Gabrielle Louise is a nationally touring troubadour noted for her poignant lyrics and lush voice. The daughter of two vagabond musicians, Louise inherited the predisposition to wanderlust and song, creating music that is anchored deeply in folk and Americana. 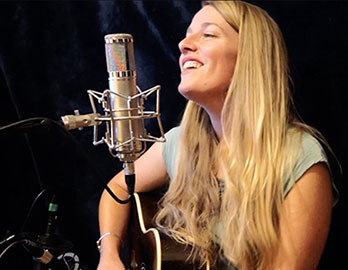 A purveyor of rich harmonies and melodic adventurism, her sound has the earthy feel of early Joni Mitchell veering into the spirited and versatile delivery of fellow genre-hopping artist Eva Cassidy. She is at one moment folkie and ethereal, the next a smoky jazz chanteuse. The Colorado-based songster has shared the stage with Richie Havens, Tom Paxton, Joan Osborne, Eliza Gilkyson, and Guy Clark. Louise has released a handful of records, the most recent of which is 2016’s If the Static Clears.